Dental problems can be found even in very young children. Tooth decay is one of the most common preventable diseases in children. Nearly 4 out of every 10 children have tooth decay by the time they start school. With regular checkups and instituting preventative measures, many of these problems can be prevented. Your child will be examined beginning at 6 months of age, using a mirror and light to look for early signs of dental problems. If any abnormalities are found, your child will be referred to a qualified dnetal professional for diagnosis and further evaluation and treatment. At the well visits you will also be given information on prevention, diet, and possible need for fluoride supplements. We do recommend that your child receive a fluoride varnish application to the teeth. Fluoride has long been known to prevent tooth decay. Fluoride varnish is a safe and effective way to provide protection for your child's teeth. This method of providing fluoride to the teeth has been used in Europe for over 25 years and is endorsed by the American Dental Association and is approved as a "device" by the FDA. Fluoride varnish has been shown to reduce cavities by 25-40%. In some circumstances, if a child does not receive regular exposure to fluoridated water, we may prescribe a fluoride supplement to be taken orally each day. This is decided on a patient-by-patient basis. Even as the first tooth emerges, it is important to start cleaning the teeth with a soft cloth or brush twice a day, and advancing to a toothbrush with toothpaste as more teeth emerge. If using fluoridated toothpaste, only an amount the size of a grain of rice is needed (not the big ribbons shown on TV). Sugar consumption is especially bad for your child's teeth, so avoiding refined sugar is an important part of prevention. We do not recommend juice, sweetened beverages (sweet tea, soda, energy drinks, sports drinks, etc). Your child should not use bottles beyond the first year of life. 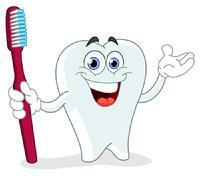 Click HERE for a link to more information about dental health!